Born and raised in North Carolina, Andy Coats has been involved in music since his early teens, when he sang and played in a hard rock band and later a progressive rock band. 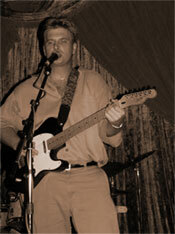 From there he worked his way back to the genres in which so much rock is rooted: the blues and other roots based music. "My passion for this sort of music really came to a head when I was about 25 years of age. I was living in Southern California, struggling through graduate school, and it was then that the magic of the blues masters fully hit me. I dove head first into Robert Johnson's material, listening to it daily. There was also this great weekend radio show, "Nothin' But the Blues", hosted by Gary "The Wagman" Wagner, coming out of Cal State Long Beach. I have fond memories of listening all day, picking up my guitar, and jamming along. This helped me get through some tough years ... . As a student I made almost no money, and I felt my career prospects were pretty bleak--there were very few teaching jobs available, and a Ph.D. in Philosophy is not exactly the most marketable degree ... . This is how I came to identify with the blues, although I will be the first to admit that the kind of problems I had were nowhere near as immediate and urgent as those of the classic blues singers." 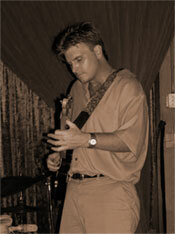 After completing his degree in 1999, Andy was able to focus all of his attention on his music. He has released three independent CDs and appeared on "The United State of Americana", a 2004 compilation put out by Shut Eye Records. He has performed live on NPR radio stations in the Midwest and in the South, and has played at a wide variety of events, including the 2006 Arkansas Blues and Heritage Festival (formerly King Biscuit), the Iowa State Fair, the Court Ave. Blues Fest (Des Moines, IA), A Ride Across America (Santa Monica, CA), and the Tsunami Blues Benefit (Long Beach, CA). 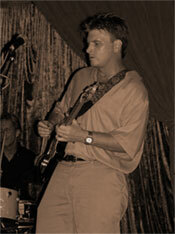 Andy has also played at venues across the country, including the premier blues clubs in the Los Angeles area: B.B. Kings, the Blue Cafe, and Martini Blues; and has enjoyed the honor of opening for national-level acts such as Eric Sardinas, and W.C. Handy Award winners Rod Piazza and the Mighty Flyers. 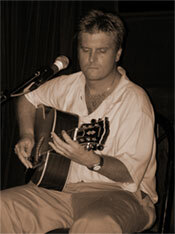 In 2003 and 2004, Andy was named one of the top blues acts in Southern California by the Southern California Blues Society, when he was selected to compete in the regional phase of the International Blues Challenge.